If you have Amazon Prime then you can now claim some free games every month. This is thanks to Free Games With Prime, the Prime in this case being a reference to Twitch Prime. But with Twitch Prime included with Amazon Prime, everyone’s welcome. Twitch Prime is a premium version of Twitch, and one of the many benefits of an Amazon Prime subscription 7 New Amazon Prime Benefits You Didn't Know About 7 New Amazon Prime Benefits You Didn't Know About You don't need Prime to benefit from Amazon. But Amazon Prime comes with a few lesser known benefits you may not have tried yet. Read More , and it offers ad-free viewing, free loot, and discounts on boxed games. And now, Twitch Prime even gifts you some free games every month. 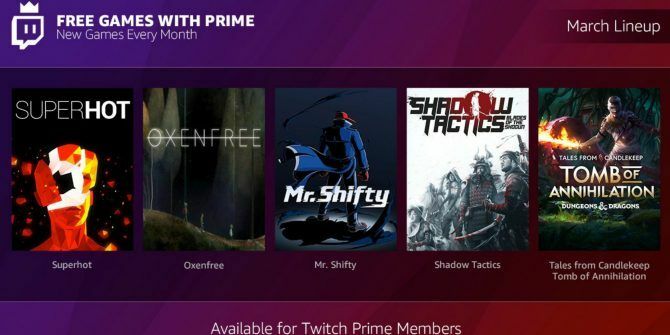 Free Games With Prime is a new program which makes a number of games available to Twitch Prime members for free every month. It’s Amazon’s version of Xbox Live and PlayStation Plus, both of which reward subscribers with a handful of free games. Amazon is kicking off proceedings with a stonking set of five free games, all of which will be available between now and March 31. These are Superhot, Oxenfree, Mr. Shifty, Shadow Tactics, and Tales from Candlekeep: Tomb of Annihilation. Another five games will become available in April. And they are SteamWorld Dig 2, Tales from the Borderlands, Kingsway, Tokyo 42, and Dubwars. Twitch has made it clear these games are yours to keep forever. Which almost sounds too good to be true. All Amazon Prime subscribers are also automatically Twitch Prime subscribers. Even if they have never used Twitch. You just need to enable your Twitch Prime membership by connecting your Twitch account to your Amazon account. Then, you need to log in to your Twitch account at Twitch.tv, click on the Crown icon in the top, right-hand corner, and click on each free game to claim it. You can then access your free games through the Twitch Desktop App. We suspect there are a lot of Amazon Prime subscribers who haven’t signed up for Twitch. They might even be gamers but not see the appeal of watching other people play games. However, Free Games for Prime might be a reason to finally see what all the fuss is about. If you are new to Twitch, you should equip yourself with everything you need to know about Twitch Prime Everything You Need to Know About Twitch Prime Everything You Need to Know About Twitch Prime Twitch Prime is Twitch's new premium offering for streamers, and offered as part of your Amazon Prime subscription. But what is Twitch Prime and how will it impact Twitch? Read More , check out the Twitch streamers to watch if you’re not into video games 7 Twitch Streamers to Watch If Esports Aren't Your Thing 7 Twitch Streamers to Watch If Esports Aren't Your Thing If you don't like eSports and you've written off Twitch as "not for you," it's time to reconsider. These entertaining Twitch streamers aren't associated with eSports in any way. Read More , and make sure you read the new rules for Twitch streamers and viewers Twitch Issues New Rules for Streamers and Viewers Twitch Issues New Rules for Streamers and Viewers Twitch is making some changes to its community guidelines. This is a long overdue response to accusations that Twitch is becoming an increasingly toxic community. Read More . Explore more about: Amazon, Amazon Prime, Free Games, Twitch. Great idea, terrible app. Plays a song, maybe two and becomes laggy as hell to the point it stops responding for minutes at a time. No thanks.